The global UV cured printing inks market is likely to see a surge in demand due to its lesser emission of VOC. The market is for global UV cured printing inks is highly fragmented in nature. The international companies are focusing on in-licensing and partnerships with regional players in order to augment their presence in emerging regions such as Latin America and Asia Pacific. Rise in crude oil prices has took a toll on the raw materials required for developing UV cured printing inks, thus the manufacturers are forming an alliance with raw material suppliers so that they won’t face deficit in raw materials which in term can deter the production. Some of the major players in the market are T&K TOKA CO., INX International Ink Co., Siegwerk Druckfarben AG & Co, HuberGroup, Wikoff Color Corporation, DIC Corporation, Flint Group, nazdar, SICPA HOLDING SA, and others. According to Transparency Market Research, the global UV cured printing inks market is likely to expand at 9.0% CAGR during the forecast period 2017-2026. The market which was valued at US$1634.5 mn in 2017 is likely to go past that value during the assessed period. On the basis of type of ink, freed radical ink type is prognosticated to hold the leading share in the market due to the surge in demand for excellent print quality accompanied with unique feel of UVcured product which the free radical UV inks offer. 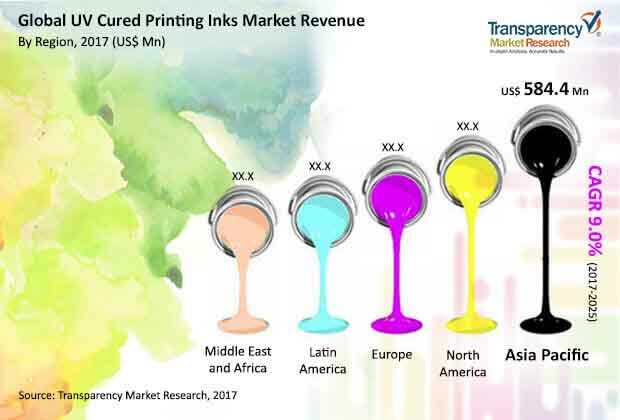 Geographically, Asia Pacific is anticipated to hold the lead in the market due to the rise in demand of UV cured printing inks in various industrial sector. The Asia Pacific is anticipated to expand at a whooping CAGR of 9.4% during the assessed period. The region is mainly driven by China, India and Vietnam. UV cure printing inks market is seeing a surge in demand from packaging sector across the world. Rise in use of digital printing these days is helping the market grow at an exponential rate. Digital printing which is helping to transform the packaging industry due to rise in demand for customized packaging, is surging the demand for UV cured printing inks. The need for digital printing on packaging is providing a distinction which has proved to attract lot of customers, is playing a major role in driving the market. Packaging substrate like cartons, labels, and corrugated boxes with customized commercialization on them have known to have a positive impact on the customers. The rise in demand for UV cured printing inks is majorly driven by the fact that it has low VOC emission. These printing inks are known to have no hazardous air pollutants. The UV cured printing inks uses oligomers, photo initiators, and monomers which are not classified as hazardous. This factor helps environmentally conscious population to rely on UV curved printing inks, thus fueling the growth of the market. Factor such as UV cured printed products which can be recycled into both low graded and high graded by using floatation process accompanied with no need for air pollution control equipment is anticipated to provide a lucrative opportunities for the growth of the market.